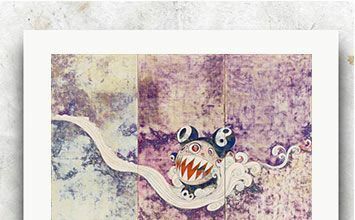 Japanese artist Takashi Murakami draws on Japanese popular culture to create his anime-like style he calls Superflat, notable for its flat planes of bright color. He uses and abuses the confluence between high and low art, producing both commercial luxury goods, cheap trinkets, and fine art. Exciting and unique, Yoshitomo Nara's sculptures of independent girls with piercing eyes have gained a cult following around the world. Influenced by the manga and anime of the 1960s, as well as Western rock music, comic books, and the animation of Walt Disney, Yoshitomo Nara's artworks transforms these innocent images of wide-eyed peoples and infuses them with horror and violence. Influenced by anime, manga, and science fiction novels, Aya Takano embraces the Superflat movement in her two-dimensional works, but makes the style her own by depicting her subjects with a feminine perspective. Takano's works are known for her specific vision into the future, presenting androgynous peoples in alternate realities, thereby creating her feminine mythology. "On one side, I am trying to show my compatriots what 'art' means on a global scale, and on the other, to the foreigners, I am trying to show the essence of our current culture." When Japanese artist Takashi Murakami coined the term Superflat in 2001, he launched one of postmodern art's most invigorated movements. Based on the compilation and compression of centuries' worth of Japanese "flat" art aesthetics, and inspired by the country's distinctively unique post World War II anime and manga craze, he inspired other artists to join him in putting Japan on the art world map. Often categorized as a Japanese form of Pop Art, Superflat has become an international phenomenon, infiltrating all areas of consumer culture from high to low art. The flat of Superflat has dual meanings. It refers not only to the history of non-three-dimensional styles of Japanese art, but also remarks on the flat, shallowness of consumer culture, something the movement has been doubly said to either celebrate or critically exploit. Although primarily drawing upon contemporary Japanese subcultures, the influence of Pop Art and Neo-Pop Art on Superflat cannot be denied because of its use of modern popular culture as a continual source of fodder. Not only does this expand Pop's reach as a movement but solidifies its foundation upon which artists worldwide are perpetually influenced by the constant stream of imagery and messages fed to society via mass media. Superflat has successfully and significantly blurred the lines between fine art and commercial art with work that ranges from traditional painting and sculpture to digital art, graphic design, and film to fashion and product design and development. Because of this, it has revolutionized the appropriation of globalized visual culture toward creating and manufacturing creative forms of art that can be accessed and bought by audiences across all economic spectrums. Japan has a centuries long tradition of "flat" art. The term generally refers to an aesthetic seen in the country's artistic output spanning many movements, styles, and forms defined by characteristics such as bold outlines, flat coloring, and a decided lack of natural perspective, depth, and three-dimensionality. Crossing periods of history and shifts in culture, "flat" has remained a strong identifier of Japanese art, all of which influenced the development of Superflat. It is only through the lens of viewing this long history that one can fully grasp the compilation that makes up this contemporary art movement, one directly informed by and drawn from all its parts into a modern lexicon. First published on 27 Mar 2018. Updated and modified regularly. Introduction to the Asian Society Museum's exhibition "Yoshimoto Nara: Nobody's Fool"
New York art critic Jerry Saltz discusses Murakami's "©Murakami"